What a terrific bunch of mathematicians we have in this class! We are ready to move onwards and upwards in our mathematical journey together. Stay tuned to this page as we unfold the various topics and learn along with us. 1) What an amount of any number look like, especially with large amounts...10,000 100,000 and 1,000,000. Do you remember how we made a tower of 10,000 cubes last year? This is an ART exhibition made of of 10,000 plastic toy soldiers. Can you find other pictures of what 10,000 looks like? 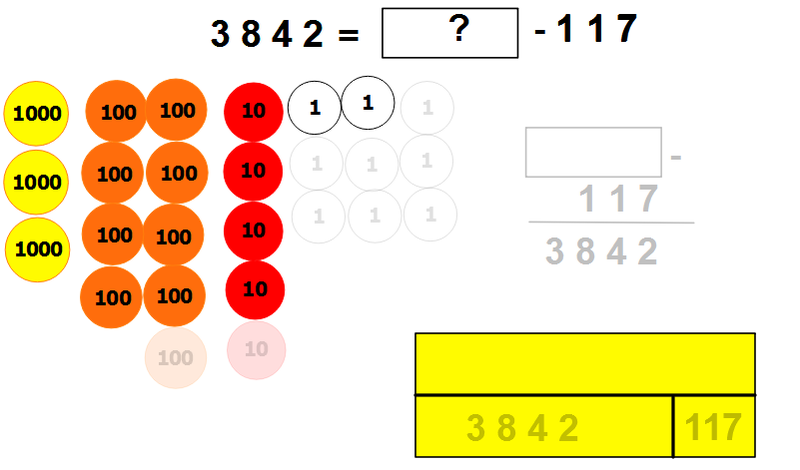 2) How to say a large number accurately and where do the digits belong when we place them in a place value table? You will find our place value chart grows wider as the numbers increase. PARENTS: If we have a number... 53,246 we are thinking about DIGITS and how each digit represents a value. e.g.The value of the digit 3 is 3000. Here, 3 is not a 'number' but a 'digit'. Wherever digits are positioned in the sequencec define what the number is. The number 3000 is much larger than the number 3.. This is called a 'Gattegno' chart and is another useful way to read numbers and how they are partitioned. 6) Negative numbers - the pdf below is a an exampe of the kinds of questions we work on. We talk about the rise and fall in temperatures and what is the difference between temperatures. Notice how the temperature drops below Zero degrees during the Winter. Perhaps there is a thermometer on your freezer at home or on the car dashboard. For a bigger challenge, think about what it means to go below Zero pounds or pence in a bank account and what being 'overdrawn' means. So how do we fix this? Here is one example. We use Place Value counters to physically build the amounts and re-think, 'How much was there before the 117 was subtracted?' The children all have these counters on their tables to make this model. Another picture which helps to fix this tricky question is the yellow box on the bottom right - it's called a 'Bar Model'. It is an extremely good way to show how adding two of the amounts will help solve the missing amount. So instead of working out a subtraction, the problem can be solved with an addition. By hitting questions like this slowly, carefully and with lots of discussion - children's understanding becomes deeper and more secure. In times gone by, children were given lists of sums to do which helped with a procedure of written subtractions, but did not help with understanding deeper concepts or connections with addition. When the numbers were then put into a real life problem, children struggled rather than have this deep understanding which could be applied. Up to now, the children will have worked with tally charts, bar models, tables and pictograms. We continue to work with these graphs but introduce a Line Graph. Typically, the children start by taking the temperature of the room or the outside weather every hour and plot these onto their graph. One of the areas many children struggle with is reading the scale - assuming the scale counts up in ones, so we always check how to count the spaces between the numbers on the scale carefully. Another problem is drawing their own scale on a graph - equal intervals between numbers on he axis are needed. We check each others labelling to see that each number is accurately spaced. Geometry skills are needed too. Have a sharp pencil, draw exactly on the line, use a ruler. Many children struggle to hold a ruler and draw a straight line accurately, so I do give a strong focus on those skills too. Labelling the axis with a name and a title are often forgotton. I shouldn't have to ask, 'What is this axis representing?' because a label should be on both axis to tell me, as well as an overall title for what the graph is about. Finally, interpreting the information, and fathoming out the story behind a graph is studied. then more challenging questions such as ..
Take a good look at this graph - it's nicely illustrated (which is not usually the case) and gives you a sense of the story behind the line.